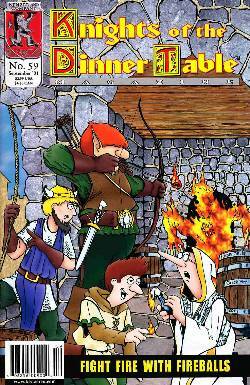 Knights of the Dinner Table is the longest running comic on the subject of gamers and the games they play! Though B.A., Brian, Bob, Dave, and Sara may play different characters in different games, their personalities always shine through. KoDT also features d20, HackMaster and other articles for gamers, from a gamer's perspective. A hilarious and hysterical slice of (fantasy) life in strips, features and a wonderful celebration of the gaming culture!